While spring is a little late arriving this year and still continues to be threatened with the occasional overnight frost in our neck of the woods, the outdoor bird community that my wife has worked so hard to foster at our home is buzzing with activity. And by "buzzing", I mean BUZZING! With the daylight lingering later into the evening my wife and I were able to make the time to enjoy the antics of the numerous outdoor bird species - including the hummingbirds. If you've spent any time observing hummingbirds, you'll know they carry big appetites in those little bodies and aren't too keen on sharing their meal. I was able to capture this Ruby-throated hummingbird as it took a moment to relax after chasing the competition away from one of our many feeders. "Little Guy, Big Attitude" seemed an appropriate title in this case. 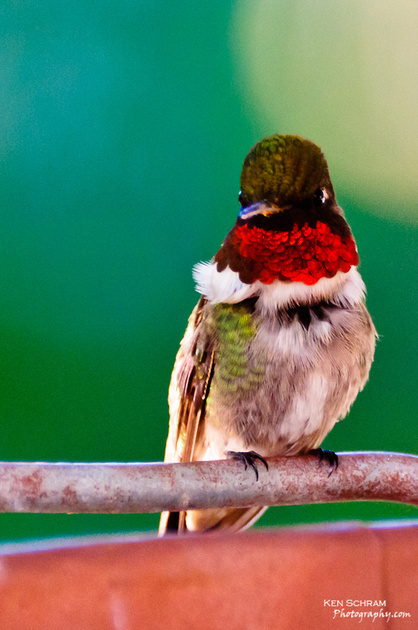 Do you have a favorite hummingbird photo? Why not share a link, a short story, or an alternate title for the image above in the comments section below?